DreamWorks has declared this week Shrek Week! And to help them celebrate, we are giving away seven copies of Shrek Forever After on DVD ($29.99 MSRP) to our readers. Entry details are below. Blu-ray and DVD editions of Shrek Forever After are available in stores starting today. In addition, Shrek fans also have the chance to become a part of Shrek’s legacy by helping to create the largest photo-mosaic ever. Visit the Shrek Photo-Mosaic website, upload a favorite photo and see it become a part of a mosaic image of Shrek and his friends. 1. Become a Fan of the Techlicious Facebook Page. Just "Like" us in the box below. Already a Fan? Skip to step 2! 2. 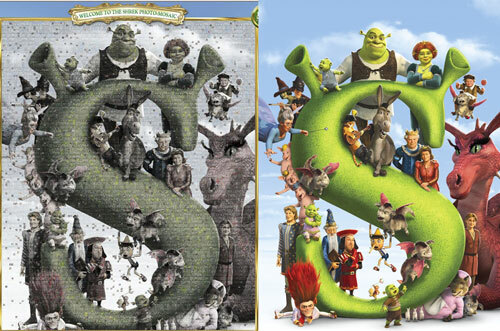 Once you are a Fan, tell us in a comment below "Who is your favorite character from the Shrek series?" Be sure to provide your email address in the "E-mail" box when you comment so we can contact you if you win. Don't worry, it won't be shown and we won't use it except to contact the winner! Winners who do not provide email contact information will be disqualified. See Official Rules for more details. We will randomly select seven (7) winners from the entries. No purchase is necessary to win. The giveaway will end at 11:59pm on December 11th, 2010. Void where prohibited. U.S. residents only. Click here for the full rules. Donkey is my favorite character. Donkey is my favorite character. Would love to share the DVD with baby. My favorite character is Shrek! My favorite character is Shrek! and I also like Princess Fiona. My favorite is “Donkey”. Too funny!! My favorite character in Shrek series is Shrek him self. My favorite is Princess Fiona. I now like you on facebook and my favorite is Fiona! My fav is the onion himself: Shrek! Donkey is my favorite character. I’ve always been an Eddie Murphy fan and he brings out the best of Donkey lending his voice to make the character. I love the donkey! He is soo funny!!! We all love Donkey the best. Has to be Donkey with his wisecracks. Donkey is my favorite character from the Shrek series. the gingerbread man and Donkey…. I’ve always been partial to the donkey. Donkey is my favorite character!! Hands down, PUSS IN BOOTS! Donkey is my favorite charater in the Shrek series. Thanks for the giveaway offer. Puss in Boots is my favorite! I love Gingy!! He is my fave. My favorite character is “Puss in Boots”. Loved the children books when I was a little girl. How could I choose one favorite character? Each one has qualities and personality that rock! I’m a Gemini and have a tough time making decision (so I’m told through my horoscope, LOL). The Shrek movies are never tiring or boring and we watch them over and over. Merry Christmas to all! I love the donkey and so does my son. What a great movie for everyone! !